Texas Gets The Accordion Bug And Never Looks Back A loud, party-friendly "orchestra in a box," the accordion spread like wildfire across Texas after German and Czech immigrants brought it to their dance halls. Out of the polka came styles like conjunto and zydeco. Wade Goodwyn reports on where the instrument stands today in the Lone Star State. Flaco Jimenez is one of the foremost players of conjunto, a Tejano musical style that developed after German and Czech immigrants brought the accordion to Texas. It's a well-known story — the one where European conquerors ravaged the New World with disease in the 15th century. That story repeated itself, in a very different way, in the early part of the 20th century in Texas. Only it wasn't illness that German and Czech settlers were spreading to unsuspecting Hispanics, Creoles and Cajuns. This time, it was a musical instrument from which they would not recover. Step Rideau playing a Martin French accordion. It started in the dance halls in the Texas hill country. While German and Czech farmers danced the polka on Saturday nights, their Hispanic farmhands would gather nearby to watch and listen. It was a mistake. Because they had no immunity, the button accordion began to spread through these Hispanic communities like wildfire. 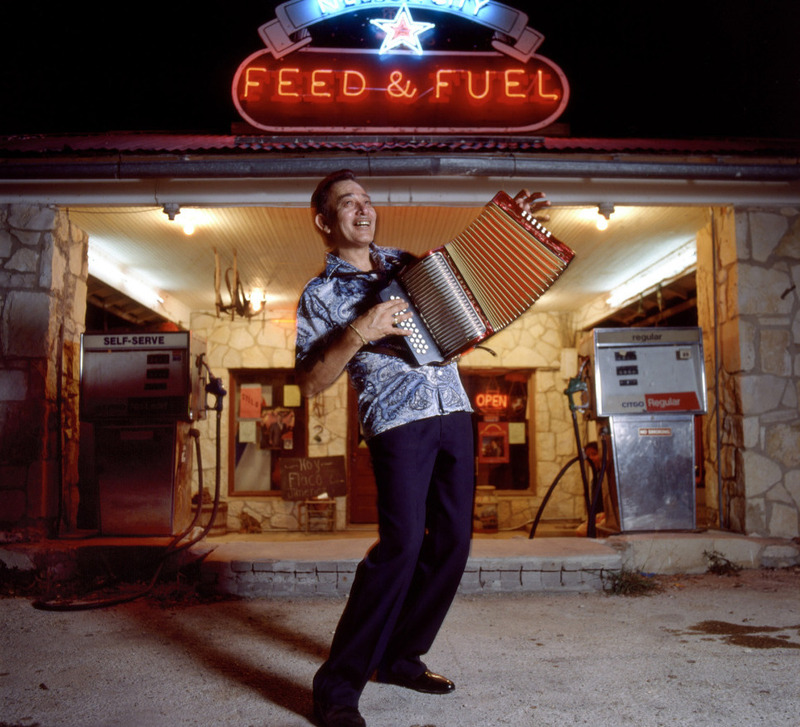 From New Braunfels and San Antonio, down to Brownsville, back up the coast to Corpus Christi and Houston and then across East Texas like a ladle full of gumbo, the accordion resisted all attempts to control it. And the infection, it seems, is now permanent. The diatonic button accordion had many qualities that made it attractive to a Texas working-class agrarian community. First, they were cheap and easy to play. The early models had just one row of buttons; later models had two, and in 1906 you could buy one for as little as $3. Another key to success? They're loud — you don't need an amplifier or electricity. Add a drummer and guitar, washtubs of cold beer and voila, as the Cajuns say. The early Sears catalogs described the accordion as an "orchestra in a box." 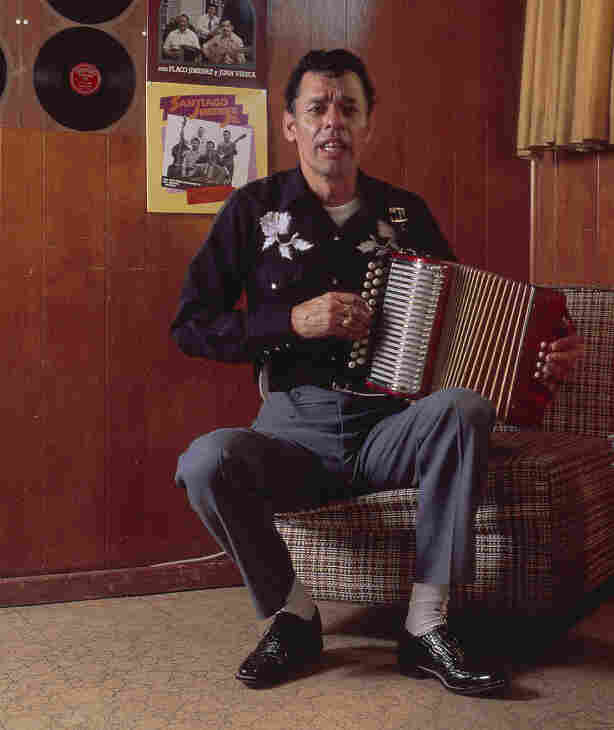 Santiago Jimenez, like his brother Flaco, is a conjunto master. Whether it's a zydeco or conjunto or German and Czech polka band, the accordion player is almost always the bandleader. 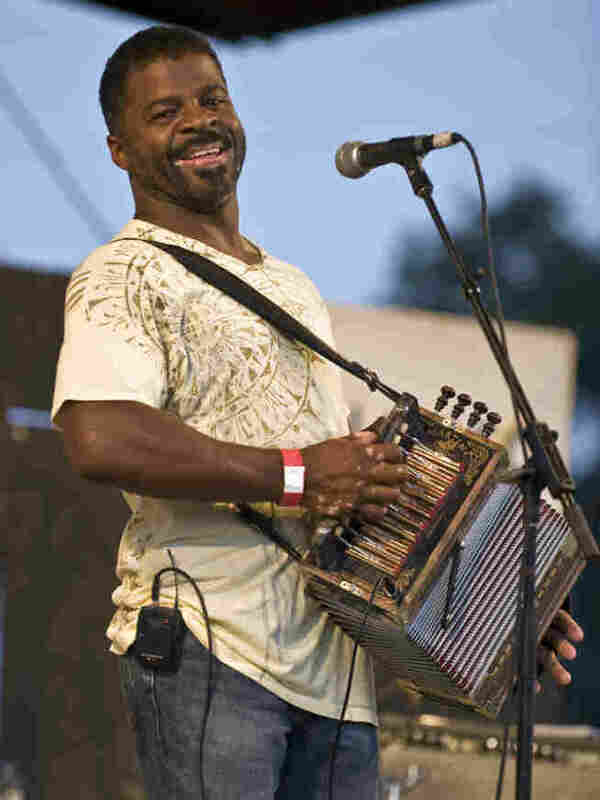 Step Rideau, the accordion player and lead singer of Step Rideau and the Zydeco Outlaws, was born in southwestern Louisiana, but moved to Houston in the mid-1980s and never looked back. Rideau's inspiration was the great Boozoo Chavis, but he developed a sound of his own. Young people flocked to hear him. "People wanted to see someone young and coming into their own style, and still feel the richness of the heritage and the culture in the music," Rideau says. 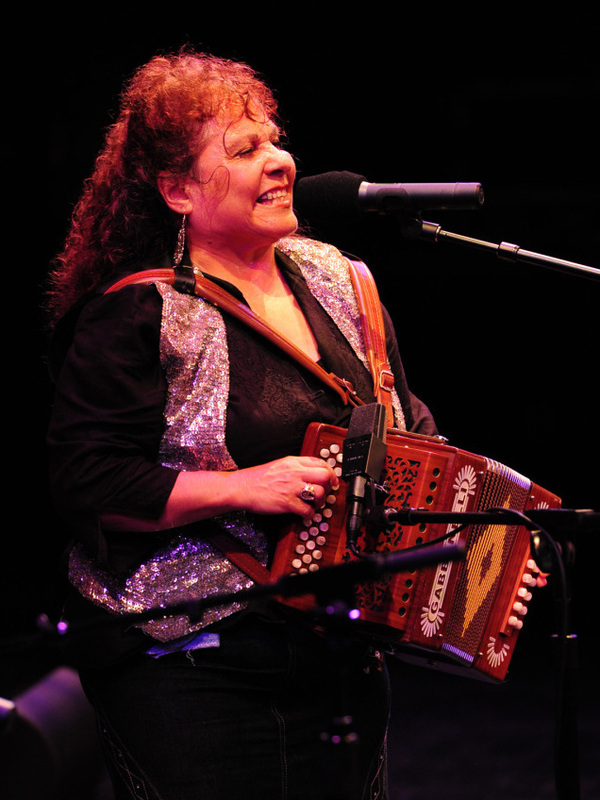 Eva Ybarra plays at the 2010 Accordion Kings and Queens festival in Houston, Texas. As popular as zydeco is in Texas, conjunto music is just as popular, and its heritage just as rich. Santiago and his little brother Flaco Jimenez from San Antonio are two kings of the conjunto. It's music played with a button accordion, a big 12-string guitar called a bajo sexto, bass and drums. Although the song "Viva Seguin" is clearly Tejano music — music made by Hispanics in Texas — listen carefully and you can hear a polka, with electric bass taking the place of the tuba. These days, conjunto music, like zydeco, is as popular as ever in Texas. Young accordion stars wield their instruments like lead guitars, spinning, stomping and dancing across the stage. While it's mostly men behind the squeeze box, there are female stars, too. One of the first (and still one of the best) is Eva Ybarra, known as "Queen of the Accordion." Ybarra is just over 5 feet tall, and if you didn't hear it, you'd never believe that such a voice could emerge from such a small package. Ybarra started singing and playing conjunto in the ice houses of San Antonio when she was just 15. It was shocking: Teenage girls weren't supposed to play the accordion with lusty abandon in the early 1960s; they weren't supposed to play it at all. On one occasion, after some of the audience shouted out "Eva!," the other members of her band left Ybarra stranded in a dark parking lot. Being a curiosity was one thing; outshining male musicians was another. Her mother had to pick her up. Chris Rybak with his Roland FR-7X digital accordion. "My mom said, 'You don't have to play the accordion, I'm going to buy you a piano,' " Ybarra says. "And my dad said, 'Don't listen to your mom. Your key is the accordion.' And, you know, my dad was right." If conjunto and zydeco are still attracting plenty of talented young Texas accordion players, German and Czech polka, the wellspring, aren't doing quite as well. While there are still German and Czech communities in the Texas hill country, they are no longer bound together by language. Their children and grandchildren mostly listen to rock or country, but there are exceptions. Fort Worth has a young accordion star named Ginny Mac, and accordionist Chris Rybak hails from Hallettsville, Texas, near Shiner and Yoakum. Rybak is Czech; his family has been in Texas since 1880. He got his first accordion at age 12. "I never actually took lessons for the accordion," Rybak says. "I started playing by ear. My dad had a polka band and still does, and the biggest training I had was just going to the dances and listening on the sidelines." 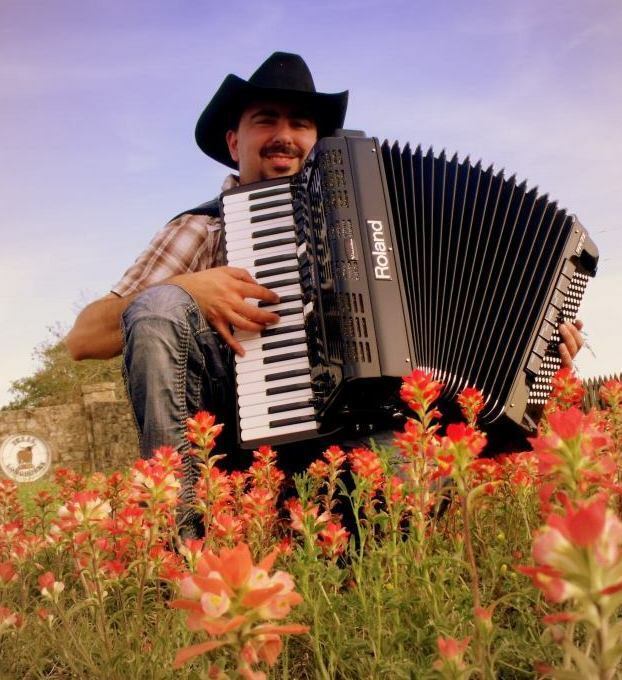 While a band along the Texas border can make a living playing only conjunto, and a band in Houston can do the same playing only zydeco, a young German or Czech accordion player is wise to play a broad repertoire. Rybak, a young husband with a 3-month-old baby girl, plays traditional polka, of course. But he also plays zydeco, conjunto and country, multiplying his chances for work. He makes solo albums, spends a few weeks in the summer playing festivals in Italy, Austria and Germany — it's not a bad life. Rybak plays a Roland digital accordion, a new kind of accordion which allows him to shade the sound in different ways. At times, he can make it sound a little violiny, or fiddly. This coming weekend in Houston is the biggest accordion festival in the state. Many of the state's best accordion players — young and old, including Rybak — will gather for the Accordion Kings and Queens competition. Their loyal followers, hundreds of German Texans, Hispanic Texans, Cajun Texans and just plain old Texans, will dance, all together, in front of the stage. Watch a video about the Accordion Kings and Queens festival.